This week's edition of Greenwich Council's propaganda rag is out today and leads on the botched launch of their campaign to build two new Thames road crossings. "The royal borough, working closely with Newham Council north of the river launched the campaign officially in front of the media and TV crews." Except there wasn't a single TV crew at the launch, let alone multiple TV crews. There were however a number of very real protestors, who funnily enough don't get a mention in the report. It's a strange editorial process. Real protestors - ignored. Imaginary TV crews - included. You can read our report of the launch here. The News Shopper's report quoting us is here. The launch of a campaign to build two new road crossings across the Thames was hijacked by environmental campaigners this morning. 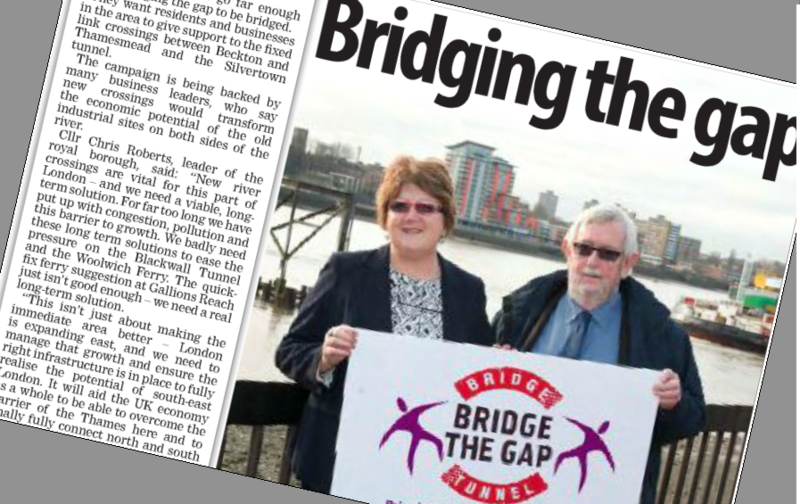 Councillors from Greenwich and Newham met by the Northern side of the Woolwich Ferry to call for a new road bridge at Gallions Reach and a third Blackwall Tunnel at Silvertown. However, they were interrupted by chants from environmental campaigners opposed to both crossings. Last week The Kidbrooke Kite launched a separate campaign with Darryl at 853, to stop plans for a new tunnel at Silvertown. I spoke to Greenwich Cllr Denise Hyland at the campaign launch this morning. She admitted that the council had not looked into the impact the tunnel would have on traffic and pollution levels on the A102 and A2 before launching the campaign. "This is TfL's job to do this not the Royal Borough of Greenwich. We are a stakeholder and we will hold TfL to account around traffic modelling, environmental impact and the like." "I talk to businesses all the time and businesses and cab firms are absolutely desperate for this... We speak we believe for the majority of residents and businesses in the borough and that's what we're elected to do and that is what we are doing, showing leadership." "What we know, and I take you back into history, is that the Romans discovered that when you put a bridge across a river you get prosperity either side of that bridge and that is really important to us." "any dissenters from the Bridge the Gap campaign are perfectly entitled to their opinion I just don't happen to agree with them." "I think it would be tolled because how else would you pay for the Silvertown Tunnel because everybody would head for that crossing instead of Dartford and Blackwall. It makes sense for all the crossings to be tolled." Protestors at the campaign launch today included former Green Party Mayoral candidate Sian Berry. "New Thames road crossings would just add to traffic, congestion and exacerbate air pollution which is already a health hazard. The priority should be to make our streets safer to walk and cycle and provide better public transport - which would help free up space on existing river crossings." "Never before have we seen such arrogance and conflict of interest from Newham and Greenwich Councils. Using Council Taxpayers money to promote a building project that they haven't heard a single piece of evidence about nor consulted a single resident. It beggars belief that the planning application will then go before both of Councils planning boards. It's the death of the democratic process as we know it." You can sign the petition against the Silvertown Tunnel here. You can respond to TfL's consultation here. You can contact the campaign against the Silvertown Tunnel here or via Twitter. UPDATE: Campaign against Silvertown Tunnel gaining momentum reports the News Shopper.